KCM GRC: How Do I Satisfy/Complete Tasks? After you are notified via email that you have been assigned a Task in KCM GRC, you will need to satisfy the requirements of the Task and then mark it as Completed. Read the sections below to learn how to complete your assigned Task. What If My Task Didn't Get Approved? Thoroughly read the Task Reminder email you received. 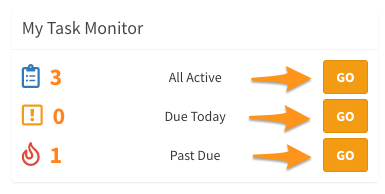 Use the link in your Task Reminder email to log in to your KCM GRC account and navigate directly to your assigned Task. Thoroughly read the Task description from the View Task page. Read through any notes under the Task Notes section within the Task. Look for any items under the Control Documents section of the Task. This section may contain relevant documentation to help you complete your Task, such as policies to keep in mind, example Evidence, and other useful information. Check the Update Task Status section to see whether or not Evidence is required. A black box in the top right corner of the section will say what items are required in order to change the status of the Task. Click the link in the email you received about the Task. While logged on to the KCM GRC console, select Tasks from the navigation panel on the left-hand side of your account. While logged on to the KCM GRC console, click GO next to any of the categories under My Task Monitor from My Dashboard. Evidence can be supplied in one of two ways: either as a DocuLink or by uploading a document to the console directly. DocuLinks allow you to insert a link to a file that will direct the users to a document housed at an outside location. You may want to use a DocuLink instead of uploading a document if you would rather keep your documentation on your own server. In the Supporting Evidence section, click Create Link to create a DocuLink or click Upload Document to upload a document directly to the console. You may have permissions for one option and not the other. Follow the steps for the option you selected. In the Name field, enter the name of the document. You can also include the version and a description, but it is not required. 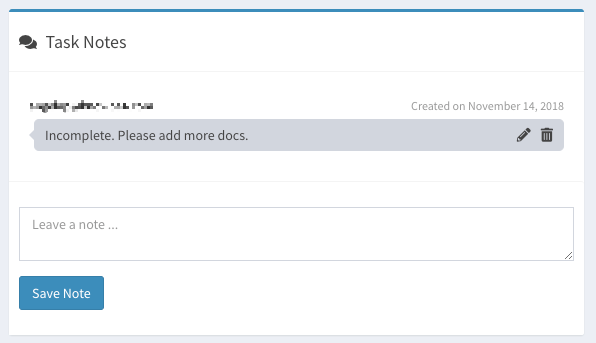 From the File to Upload field, click the Choose File to browse your computer for the document you wish to upload. Click the appropriate document and click Open. If you experience any issues uploading your file, please see here for Evidence file limitations. In the Name field, enter the name of the DocuLink. You can also include the version and a description, but it is not required. In the Link field, paste the hyperlink for the document. Repeat the above steps as needed. Once you are certain that you have met the requirements of the Task, you will need to change the status of the Task to Completed. If there is an Approving Manager for the Task they'll receive a notification at this time. They'll be able to review the Task Evidence you've submitted before marking it as Approved. From within the Task, click the drop-down menu under the Update Task Status section and select Completed. You can see how many of your Tasks are awaiting manager approval under the Approvals section of My Dashboard to the left of Awaiting Manager Approval. If the Approving Manager sets the Task Status to Insufficient, the Task will be reopened and you will receive an email saying your KCM Task Approval Failed. You will then have the opportunity to submit more Evidence. When you are satisfied that you have met the criteria for the Task, set the status to Completed (or Completed Late if it is past the due date). KCM GRC: How Do I Approve Tasks?